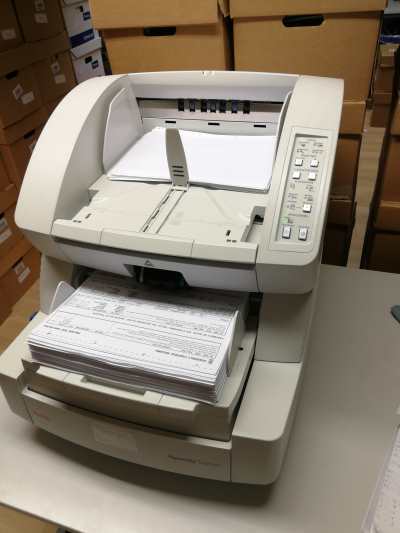 From the smallest printed expense receipt, to large format technical drawings and plans, whatever paper-based documents your business handles, we have the expertise and cutting-edge scanning technology to prepare, capture and index them for you. Once your documents have been scanned, we can host them for you via our powerful Electronic Document Management system, giving you the tools to manage and search them from your desktop..
We understand how critical your paperwork is, and we know how important it is to be able to search and access data from your documents once they’ve been scanned. The quality of the scans we make is paramount to us. We employ state of the art scanning technology from Kodak, Canon, Bell & Howell and other leading suppliers throughout our business, and we apply a four-stage quality control process to ensure that every scan is up to scratch. Once we’ve scanned your documents, we can supply the digital files to you in a file format of your choice, including TIF, PDF and JPG. And If you need the content of the digital documents to be searchable, we can use Optical Character Recognition software to deliver a file containing ‘live’ text. Once your documents have been scanned, we can host them for you on our servers, and give you easy access and search via your web browser, using our powerful cloud-based Electronic Document Management system. If you prefer to host your files yourself, we can install your files and our Electronic Document Management software onto your servers, giving you exactly the same fast access and search capabilities. And if you already have an EDM installed, such as MWorld, Basware, Filestream or Serengeti, your scans and data can be easily integrated. If you’re using our EDM system, we can add linking to any of your scanned or imported documents, so that you can search and view associated documents quickly and easily. The linking uses a unique reference code, such as an Invoice number, to tie each set of documents together. Now... what do you need to scan? Purchase Invoices are sent to us, either from you or direct from your suppliers, scanned and the required data extracted. The invoices are moved into a workflow, with rules that can mirror your previous manual process, so each invoice can be routed to the correct personnel for authorisation. This improves process, and aids compliance with requirements to store PI’s for 6 years. solution to manage Expense Claims or other form-based applications. Alternatively, we offer our own, web-based Purchase Ordering system, InForm, in which digital PO’s are processed through routes of an authorisation workflow for approval, then linked to the Purchase Invoice and Goods Received Notes. We can scan in your Remittance Advice Notes and then link these in our EDM system to your Delivery Notes and Sales invoices. We can scan in your Delivery Notes and then link these in our EDM system to Remittance Advice Notes and Sales invoices. your Delivery Notes and Remittance Advice Notes. The EDM interface can be customised with your own branding, creating a convenient tool for sending out Copy Invoices. We can scan Goods Received Notes and link these for you in our EDM system to your Purchase Invoices and Purchase Orders. Whatever size, format or binding your client files are in, whether they are colour or black and white, and whatever your requirements are for final file format, we can manage this for you. Technical and engineering drawings come in sizes from A4 right up to A0, and may vary widely in terms of their condition. We can repair and prepare your large format documents, and scan these using our specialist large format scanner. into digital scans, protecting them from further deterioration. Our own Universal Filing solution allows digital documents, such as Client and Personnel files to be classified as if they are in filing cabinets, using a simple, recognised structure of Cabinet, File and Folder. This makes storing, searching and retrieval both simple and intuitive.